Periodically, threads turn up on the kind of websites I frequent that ask, "What Star Trek books / Doctor Who audio dramas / Star Wars comics do you consider part of your personal canon?" Or, worse, "head-canon," a word which is just ugly. Head-cannon: D'harhan from Star Wars. I don't usually participate in these discussions, because I don't think I think of canon that way. Now, I'm not saying I'm one of those holier-than-thou pedants who turns up to canon discussions to say, "Well, actually, the term 'personal canon' is an oxymoron because the word 'canon' implies an authority making the decision blah blah blah. "* No, I just think that the question describes something more rigid than the way I actually think about these things. I don't go, "Well, Prime Directive, that's in the personal canon, but Enterprise: The First Adventure is right out. And because Prime Directive is referenced by Traitor Winds, then Traitor Winds must also be in, but Enterprise: The First Adventure is a semi-prequel to The Entropy Effect, and so by the transitive property of canon, that's disqualified. Destiny is in, but only scenes beginning on odd-numbered stardates. And so on." No, I think that the way we decide what's "real" and what's not "real" in the context of a fictional universe is much more flexible than that.† Let's move from these weird hypotheticals I've been using and get specific. Star Trek is the universe I've probably spent the most time in (though it's not quite my First Fandom). I don't know exactly when I read my first Star Trek book, but I think it must have been around the fifth grade or so. As a result there are a number of things I accept as "true" for the Star Trek universe because I read them as books when I was a kid, and thus they were absorbed into my conception of the universe itself. Never mind that the books aren't "canon," that didn't cross my mind, and it still doesn't most of the time. Rather, there are just "facts" that I know to be true in the context of Star Trek. Take Greg Bear's 1984 novel Corona. I actually don't really remember much about it, but what I do remember is that-- in an aside-- it's mentioned that the Klingons, the Romulans, and an alien race original to the novel, the Kshatriyans, share a common ancestor. Well, given Romulans are an offshoot of the Vulcans, that means the Vulcans must be part of that equation too. For me, this is just a basic assumption of the Star Trek universe, it comes up without me consciously deciding, "Aha, Corona is designated 'HEAD CANON, PART OF'." Jeri Taylor, executive producer of Voyager, wrote an excellent novel called Mosaic, about how Kathryn Janeway came up the ranks of Starfleet, from a young cadet to a tyro science officer to a commander. It would be impossible for me to think of the character of Captain Janeway and not imagine that book's events as her history. It always has been. Why pretend she has no history when she has this one? 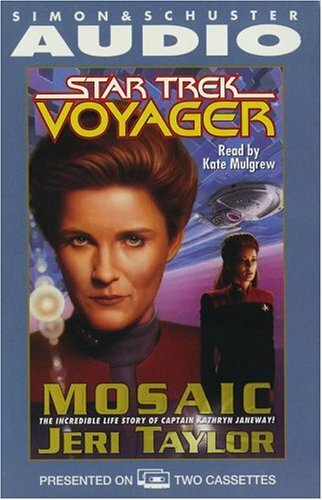 Back in the day, Kate Mulgrew would read you the story herself-- on two whole cassettes! Do you know there's a book (actually a whole series of 'em) co-written by William Shatner where the Borg and the Romulans team up to bring Captain Kirk back to life? Now, Captain Kirk is still dead in my head canon, but the first one, The Return, has some of the coolest stuff that has ever been written about the Borg. 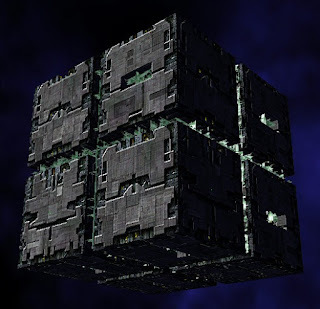 In my Star Trek, the Borg totally combine eight cubes to make one even bigger cube, assimilate dogs to turn them into guard drones, and pause to run a diagnostic if you ask, "Are you defective?" This is kind of like the supercube described in The Return, except I don't think there's the clear delineation between constituent cubes. The Return posits that all Borg cubes are made up of smaller cubes, hence why they all have so many redundant systems. This image is from a videogame, I think. Or, even before I got to Time's Enemy in my Deep Space Nine rewatch/reread, I had it in the back of my head that Jem'Hadar always spoke the languages of their enemies in front of their enemies so that no one could learn their codes. This is actually superseded by on-screen dialogue in a later episode, but I don't care, because the idea given in Time's Enemy is too good to discard. 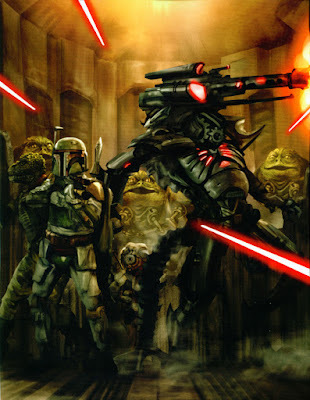 For me, these stories aren't canon, and they aren't not canon, either. They're just part and parcel of the large, weird tapestry we call Star Trek, and they inform how I think it works on a fundamental level. Even if the canon goes on to contradict them (as it already has in some cases), I will likely always believe these facts to be true. Inasmuch as any aspect of Star Trek is true. Which is to say completely true. * Or, if you want to be even more obnoxious, you can point out that properly "canon" is a noun: books aren't canon, they're canonical. † Unless you're hired by a rights-holder to write some fiction set in that universe, but as that hasn't happened to me in five years, I don't really worry about it.